By William Mackay: If IBF/WBA light welterweight champion Amir Khan (26-1, 18 KO’s) doesn’t fight the winner of the August 27th fight between Robert Guerrero and Marcos Maidana, Khan will reportedly be stripped of his World Boxing Association title according to Bolton News. Khan hasn’t defended the WBA title since taking an optional defense against Paul McCloskey last April. Khan’s trainer Freddie Roach reportedly doesn’t want Khan to fight Maidana again, no doubt because of how close Khan came to getting knocked out in his win over Maidana last April. 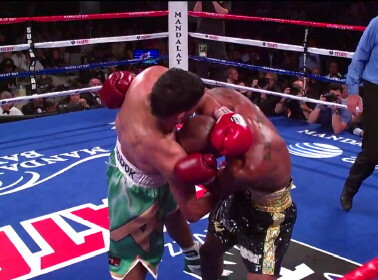 Khan was staggered in that fight and took a ferocious beating along the way to winning a 12 round decision. Khan only plans on fighting one more time at light welterweight before moving up in weight to the welterweight division and he might not care if the World Boxing Association strips him of his belt. The opponents that he’s looking at fighting in his next bout are as follows: Erik Morales, Maidana-Guerrero winner and the Breidis Prescott vs. Paul McCloskey winner. It’s highly doubtful that Khan will face Maidana if he emerges as the winner, and same goes for Prescott. Maidana and Prescott are probably too dangerous for the tender-chinned Khan. But Guerrero, who is moving up in weight from the lightweight division and seems to have lost his power in moving up three divisions in the past two years, is someone that Khan might be interested in facing if he beats Maidana. Guerrero is slow and more of a technical boxer like Khan. He’s not someone Khan will have to worry about getting knocked flat against like he would if he faced Maidana and Prescott again.